This monumental painting depicts female workers marching on their way to the harvest to fulfill their socialist duty, in the image of their male counterparts who marched off to World War II. 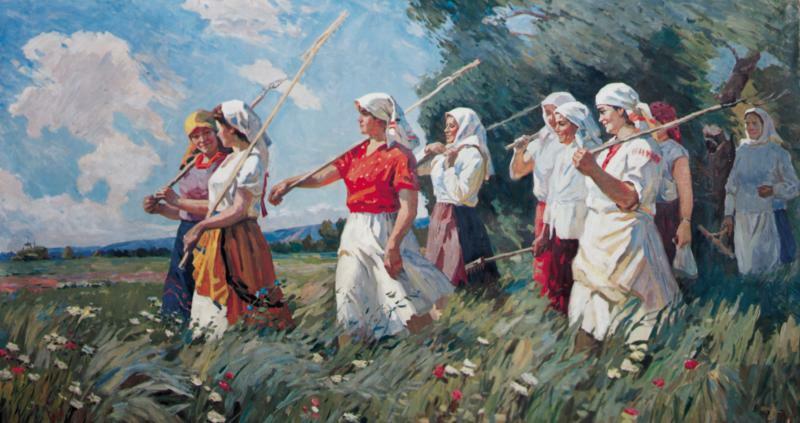 The women cultivated virgin lands using hoes instead of guns in their contribution to the expansion of Soviet power. The focus of this painting is the woman in the middle, who wears a stark red tunic – the uniform of international communism. Various versions of this painting exist due to its politically correct depiction of the scene and success as an image. It is also worth noting that such scenes of communal solidarity are produced in times of poor harvest.